As developers mow down the remnant of urban culture and bring the suburbs into the urban heartland, the locals are a tad P.O. Uprooting cottages for flats that look like offices, speeding down narrow streets where children play and destroying a treasured a metro arcade is ultimately changing Melbourne. Easing through the morning at the DeGraves underpass starts the day off on a ‘good foot’, a coffee, a bit of art and a relaxed vibe. Removing this space from the Urban Art Culture would be like removing the goal posts from the MCG. The Art Deco architecture of Campbell Arcade embraces Melbourne in1955, the salmon pink tiles, black granite columns capture a by-gone period where few examples remain. The display cabinets along the subway wall host local artists and most often a busker, serenades the office troops, as they pass. Every morning commuters submerge under the station through Campbell Arcade and surface into DeGraves. What a great way to start the day. The Dressmaker exhibition at Ripponlea Estate is a great excuse to experience the opulent lifestyle of the very rich, in a past era. The house, as grand as it is, is rather gloomy. It took party girl Louisa Nathan, daughter and heiress of the Mapels fortune, to bring it into the swing of the early new Century. A fit setting for ‘Tilly’s inspirations. The pool , the tennis court and the new Deco Ballroom with a reinforced floor, built to withstand Charleston vigour was and remains, a perfect party venue. The house was designed by Architect Joseph Reed, he also designed the State Library and the Royal Exhibition buildings. The sprawling pleasure gardens that incorporate a lake and secret paths, was the brainchild of the original owner, Frederick Sargood. With the help of 40 men, they created a personal vision of paradise that is now a peaceful public retreat, in the midst of suburbia and chaotic traffic. The lush setting of the estate is in stark contrast to the butchered landscape of Dungatar yet essentially, both reject the wild beauty of the original bush. The Cinderella effect that the character Tilly waves over the unworthy, beautifies the wretched, with imported fabrics and designs. In the early part of the last Century, Australians looked to Europe for the lead in Fashion, Architecture and Art.The early settlers had not found their own voice or local patronage. “She transforms all the women from drab to Fab” Rebecca Gibney. The exhibition features designs by Marion Boyce and Margot Wilson. Wilson was the main designer for Winslet and Boyce moulds the town folk. 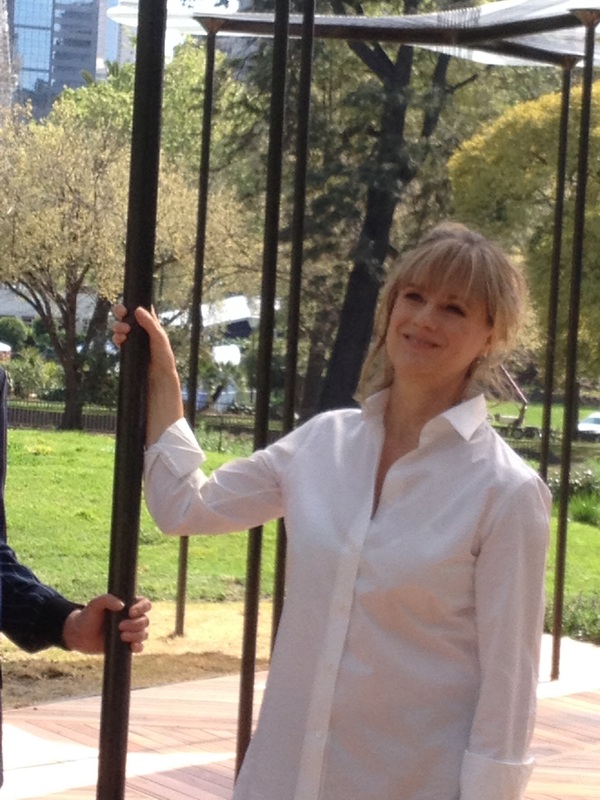 The sun shone during a Spring heat-wave as Australian Soprano Deborah Cheetham, tested the acoustics of Amanda Levete’s 2015 translucent Pavilion. Levete, an English Stirling Prize Architect, presented her vision to the creative expertise of local engineers and mouldCAM, to develop. The simple elegance of the structure undermines the sophistication of the technology involved in its construction. The modular design consists of ‘petals’ which are ‘impossibly thin’ and include LED lighting. Levete and mouldCAM sought to push the boundaries of design by exploring maritime materials and re-develop them for innovative purposes. Melbourne Press asked Levete, what her inspiration was? 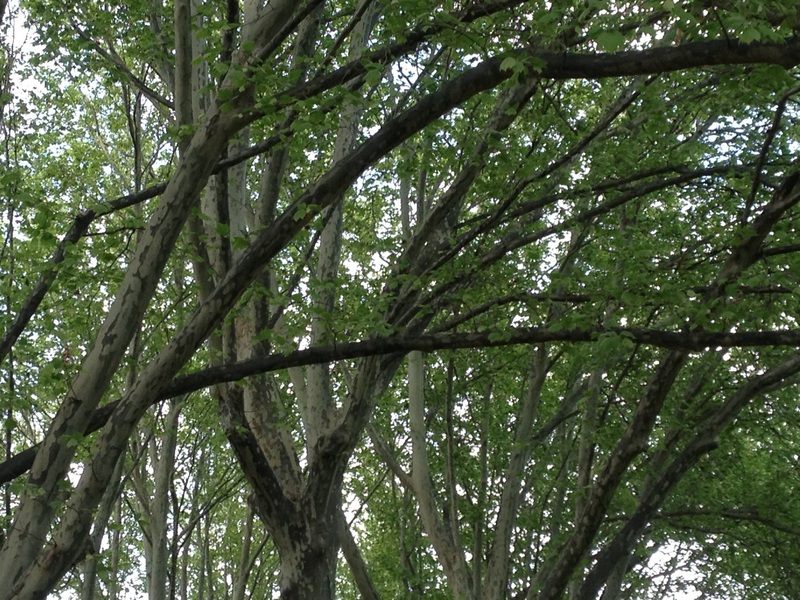 The carbon fiber poles that hold the structure are designed to move and shake in the wind, just as branches do. “It had to be a live canopy, calm when it is calm, and move when it is windy’ Jamie Marina from mouldCAM explained. 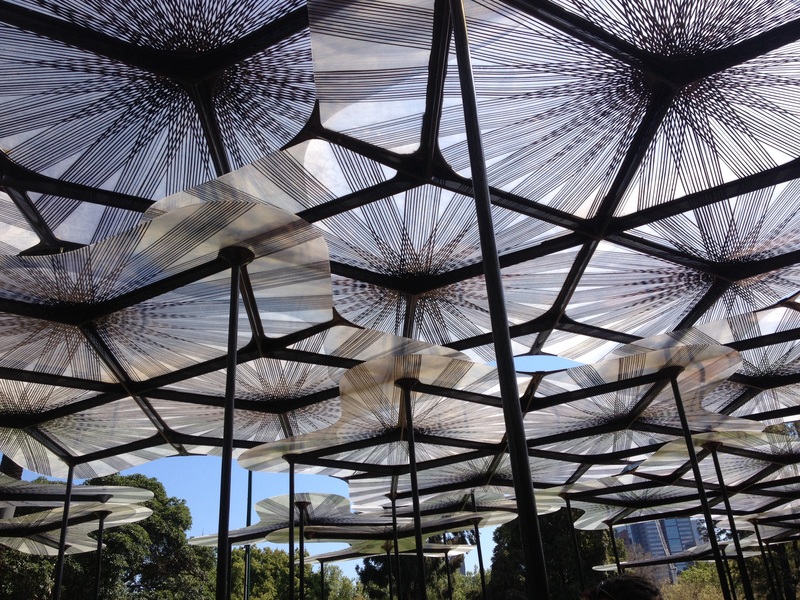 In the evening the structures ‘black arms’ are designed to disappear into the night as the petals, that are translucent by day, take on a floating glow. 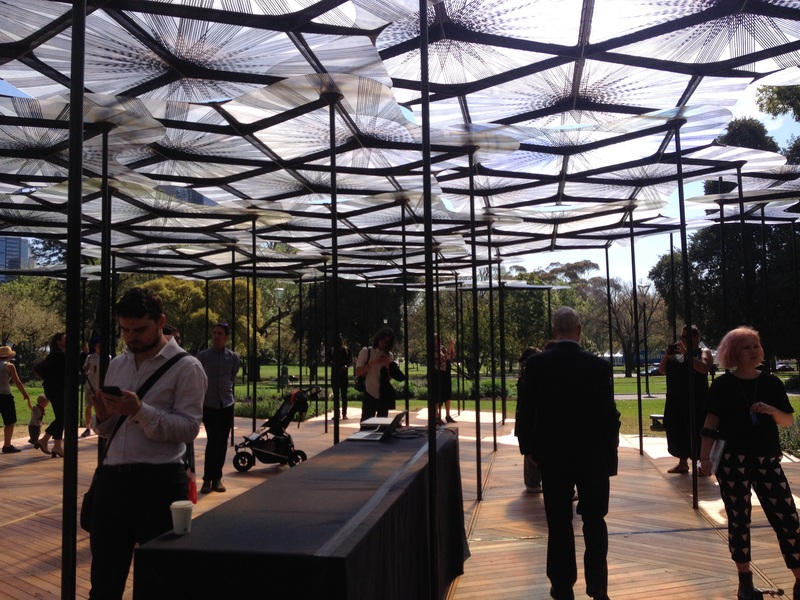 There are over 200 free events planned for the MPavilion which has been officially opened by David Roth, Director of London’s Victoria and Albert Museum. Funding for the project was through the Naomi Milgrom Foundation. Lord Mayor Robert Doyle proclaimed that Victoria is still the ‘Garden State’. Each year a new Pavilion is erected for the summer and the previous one is located somewhere in the City. The structure in this article now resides in the docklands, another has taken pride of place at the Zoo. “a place where people feel more alive’. 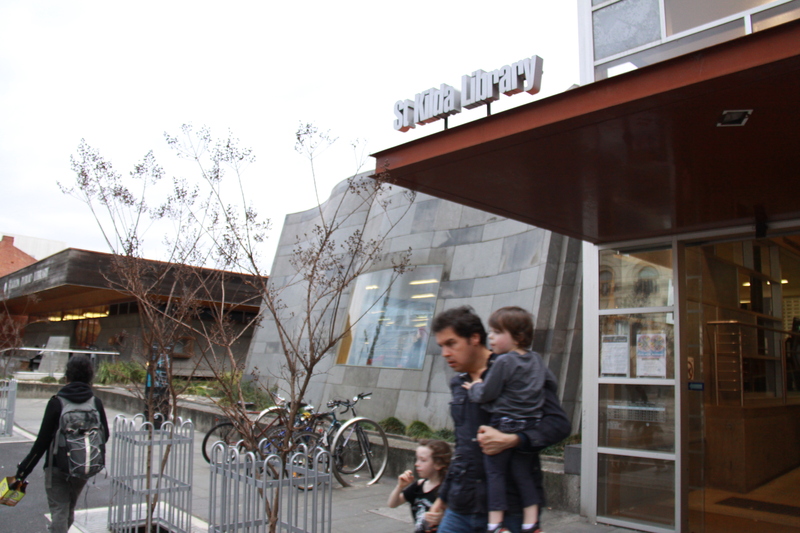 The St Kilda Library’s bold and embracing architecture is a place of respite within the busy clutter of Carlisle Street. The building invites its visitors to sit on the ledges, gather in its courtyards and participate in the experience of the creative word. Italian born, Mr Taglietti is one of the country’s national treasures and winner of Australia’s most prestigious Architectural award, the RAIA Gold Medal in 2007. 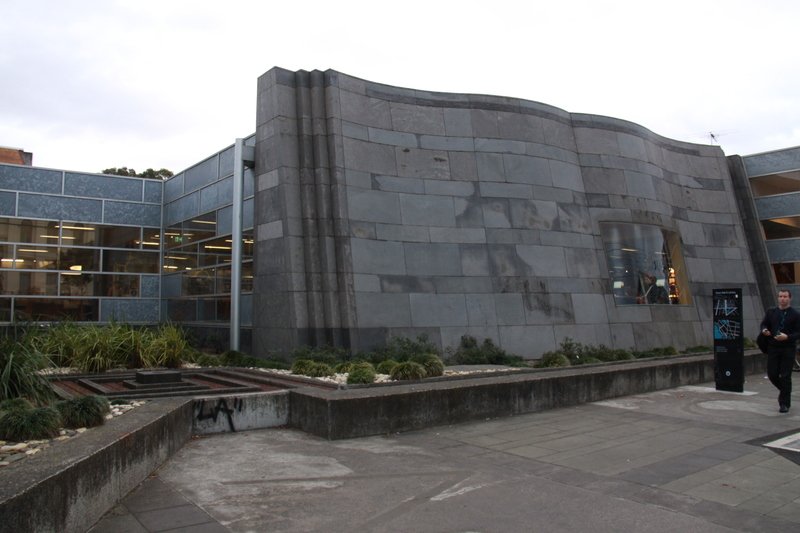 The St Kilda library is one of his earlier works and was officially opened May 14 1973. The St Kilda library promotion committee was established in 1951 to rally support for its erection. Sheer determination paved the way through episodes that could have derailed the project on several occasions. In 1954, Twelve Councillors refused to give the city a free library. ‘I rely on you ladies to get the councillors wives on our side’ quoted The Angus in its December issue 1954. As Mr Taglettis prominence as an important Australian Architect grows, examples of his work become highly valued. Builders, M. Notkin Construction of South Caulfield, were appointed to construct the building which cost $417,000 at the time, the current price of an apartment in the area. The Brutalist design is a contemporary period piece of 1960-70’s architecture and within the interior, a mural by Mirka Mora adds to the artistic collateral of the project. “Visitors may then be able to relax around coffee tables, admiring or criticizing displays of paintings…Mr Taglietti wrote in his original proposal. The architect planned for the building to be used as a refuge.The public are sheltered within its thick walls and can linger in its quiet Japanese courtyards. The outside world keeps its noisy distance. Warm timber ceilings contrast the cool grey concrete that is sculptured into a solid earthy structure. The lofty outdoor roof provide shade and shelter as people gather beneath it on the massive trapezoidal walls ledges to chat or access the Wi Fi. The building has since been renovated to cater for the expanding community, without consultingTagletti, The changes to the building include a side entrance and a new front section. The original counter was situated under an elevated roof with a skylight, in what is now the middle of the building. The new front section is expansive and moulded into the shape of a book. The changes are admired and appreciated by some but not all. Mr Taglietti was not impressed, he was baffled as to why he was not consulted or at least notified of alterations to the original building. The Architect claimed that the entry was a key aspect. Mr Taglietti was disappointed and hoped plans were being made to return it to its original state. “They totally disregarded the original’ Mr Tagletti claimed in an exclusive interview. The entrance courtyard was to be “the nucleus” of the design. This area has since been built over despite the council overlay that regards the building as significant and claimed that the front , including the original air conditioner tower was ‘ integral to the design’. “There should be protection of my moral right in that building, it should have been recognised by another”. He claimed in a tone of sheer disappointment. Mr. Tagletti came to Australia to break away from the confines of tradition in Europe and explore vivid modern constructions. He has designed the Dickson Library, the Italian Club, the Apostolic Nunciature, Giralang Primary School and the War Memorial Annexe, in Canberra where he resides.